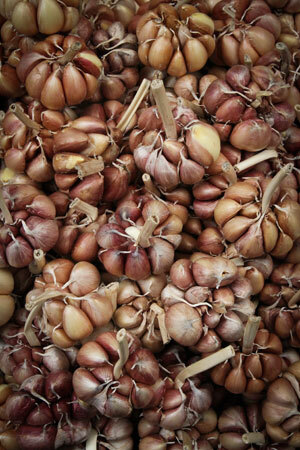 Garlic has been used for thousands of years for both culinary and medicinal purpose all around the world. It is rich in sulfur containing compounds that are responsible for it medicinal properties and pungent taste. The extraction process (fresh-crushed vs aged garlic) affects the chemical structure and medical properties. Some extracts are better suited for infections while others for heart disease. Crushing fresh garlic releases enzymes that convert the organosulfur compound allii into allicin. Allicin is relatively unstable and can react with itself to form ajoene and diallydisulfide. These compounds are responsbile for the pungent garlic odour and taste. They are small volitile compounds that are fat-soluble and can easily be extracted in oil. Garlic's antimicrobial properties are associated with allicin and closely related fat soluble compounds that have been shown to have antibacterial, antifungal, antiviral, and antiprotozoal activity. Allicin products are commonly recommended for viral infections, like colds and flus. Also they are often prescribed orally and topically for yeast (e.g. candida) and fungal infections (e.g. athlete's foot). In addition these compounds have antiplatelet effects and can help prevent blood clots but should be used with caution with patients on "blood thinners". "Odourless garlic" refers to aged garlic extracts (AGE); the aging process breaks down all the allicin and converts it to stable water-soluble compounds like S-allylcysteine and S-allylmercaptocysteine. These compounds lack significant antimicrobial or antiplatelet properties that allicin & ajoene possess, but they do have significant cardioprotective, antihyperlipidemic and antihypertensive effects. AGEs are comonly recommended for cardiovascular disease because they may reduces atherosclerosis by lowering cholesterol and decrease oxidative stress that leads to plaque formation. Furthermore they decrease blood pressure but they do not appear to thin the blood or interact with anticoagulant drugs. Garlic and AGEs possess anticancer effects against several types of cancers. Research is conflicting but garlic may decrease the risk of some types of cancers including colon and prostate. AGEs are hepatoprotective and have been shown to increase glutathione levels and protect the liver against various toxic compounds and benefit those suffering from liver disease.